This year’s United Nations annual debate over how best to battle HIV and AIDS heard that while progress had been made, it remains “uneven and fragile” with many hurdles still to come. “The world is making good progress towards ending the AIDS epidemic by 2030,” United Nations Secretary-General António Guterres told the General Assembly on Tuesday, citing the need for more accessible HIV testing, treatment and antiretroviral therapy. Where prevalence is high, young women remain vulnerable; and youth need to learn how to protect themselves. “Prevention is the key to breaking the cycle of HIV transmission,” he declared, pointing to the Prevention 2020 Road Map, which focuses explicitly on adolescent girls, young women and key populations at risk. And the 2030 Agenda for Sustainable Development calls for an integrated approach in ending HIV, he added. “Success will require us to strengthen links across these areas and build resilient and sustainable systems for health, underpinned by principles of human rights and equity,” said Mr. Guterres. Looking ahead he also touted the 2019 High-Level Meeting on Universal Health Care as an occasion to build coherence across the global health landscape on financing, programming and accountability. “At this pivotal moment, we must renew our focus and shared commitment to a world free of AIDS. The pandemic is not over, but it can be,” he continued. “Let us move forward in a bold new spirit of partnership to overcome the cycle of HIV transmission and deliver health and well-being for all,” concluded the UN chief. “This virus still has a destructive – and deadly – impact on people around the world,” he added. He suggested exploring further opportunities for action, such as the 26 September high-level meeting on TB. “People infected with HIV are 20 to 30 times more likely to develop active tuberculosis,” he explained “Without proper treatment, nearly all HIV-positive people, with tuberculosis, will die,” stated Mr. Lajčák. Finally, he drew attention to the context around HIV and AIDS and the need for universal healthcare. Healthcare is crucial to sustainable development, which is why it has its own goal: SDG 3. This will be on the General Assembly’s agenda, in 2019. And it could accelerate our drive, to eradicate AIDS, once and for all,” he said. “Let’s speak up louder – in memory of those who have died, and in support of those who are living, with HIV and AIDS, today,” concluded the Assembly president. 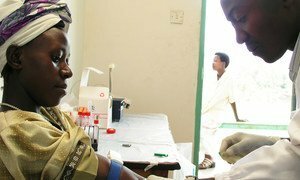 Outlining the economic and social toll HIV and AIDS continues to take on workers around the world, the International Labour Organization (ILO) called on Thursday for an “urgent effort” to improve treatment, step up testing and ensure healthier and more productive workplaces.